We have all heard before that breakfast is the most important meal of the day. Yet, most of us still are barely able to scarf down a few hundred calories of empty carbs in the morning, citing excuses like time and I’m not hungry in the morning. 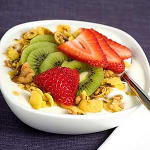 Studies have shown that breakfast is the most important meal of the day, as regular breakfast eaters are less likely to be overweight than those who skip breakfast and those who lose weight successfully are also more likely to be eaters of breakfast. Also, eating breakfast may actually reduce your risk of illnesses like heart disease, stroke, diabetes, and cancer, and it also keeps your immune system strong so you’re more resistant to stuff like colds and the flu. And we all need a bit more resistance to the elements, don’t we? People who eat a good breakfast also often have better memory and concentration. One study on kids found that breakfast-eaters scored higher on tests and are less likely to suffer from anxiety, depression and hyperactivity. That also goes for those of us who are no longer students. Mix all together and form into small 1″ balls. Place in the refrigerator for a few hours and enjoy.